Two miles above the floor of Death Valley, as I hike up a mountain trail in a temperature of 75 degrees, the image of a mid-summer day on the desert floor fades with each step. I pause at a rolling green meadow, awestruck by a brilliant display of wildflowers spread out before me. As I reach the tree line, where remnants of winter snow still linger, I struggle for another breath. 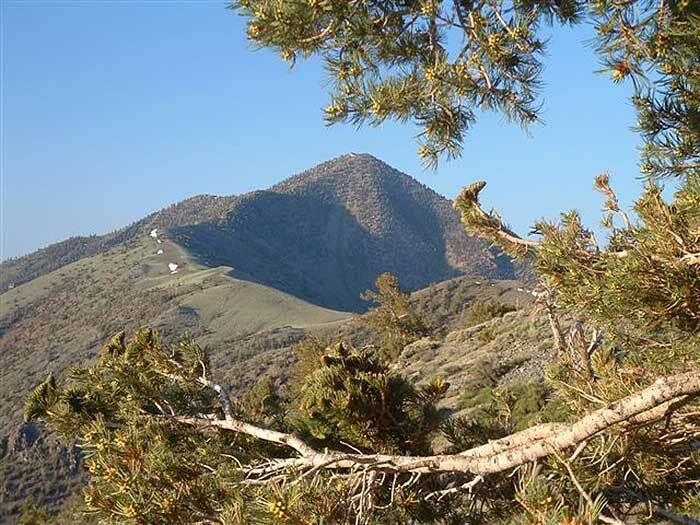 Hours earlier, our group had gathered at the trailhead at Mahogany Flat Campground, at an elevation of 8133 feet, to begin a strenuous 14-mile roundtrip day hike to the top of the 11,049-foot desert mountain called Telescope Peak. 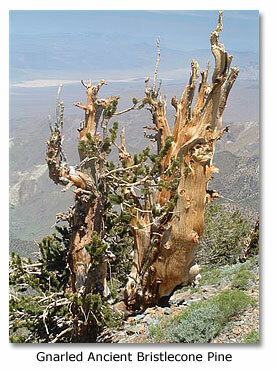 Located in the Panamint Range, it is the highest point in the Death Valley National Park. The trail is often covered with snow until June. Just a month earlier, hikers had labored through knee-deep snow over the last mile to reach the summit. We had begun our hike in arid woodlands of juniper and pinyon pine, but we soon emerged onto the open eastern slop of Rogers Peak. Below us to the east, we could see the vast basin of Death Valley. “Wow,” was all Karl could muster in response. In the first two-and-half miles of our hike, we gained 1500 feet. 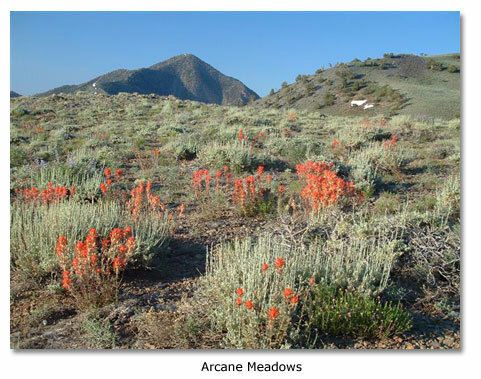 Cresting a broad saddle, we reached Arcane Meadows. We felt overwhelmed with a spring-like wildflower display of violet and red set against a backdrop of a grayish green canvas. Covering the rolling mountain meadow between Rogers and Bennett Peaks were countless lupine and desert paintbrush. We clustered next to the meadow, everyone, that is, except Scott. Captivated by the high county floral show, he could not shoot pictures fast enough. “This is so cool!” he said. “I can’t believe how beautiful this mountainside is with…” he stops in mid-sentence to compose a close-up of a brilliant red desert paintbrush. He heads off to the other side of the meadow to repeat the process. After convincing Scott that we must move on, we followed a route that led us around the western portions of Bennett Peak. We again passed through a juniper and pinyon pine zone, and within another mile, we reached a saddle on the south end of Bennett Peak. Knowing that there be no water anywhere along the trail, we had to carry enough water for the entire seven-to-eight-hour hike. Since our packs are heavier than normal, we decided to cache some water at the saddle. That would lighten our load for the final few miles to the summit. We would pick it up during our return. From this point, the trail drops onto the east side of a broad ridge separating Telescope and Bennett Peaks. We had an uneventful, almost serene passage along the meadow ridge, which was splashed with patches of white evening primrose, yellow flowering prickly pear and pink phlox scattered among lupine and desert paintbrush. We crossed the mile-long ridge and began the steep final ascent to the summit. Patches of snow still lay along the eastern escarpment of Telescope Peak. We moved from the meadow into stands of limber pines and gnarled and ancient bristlecone pines. 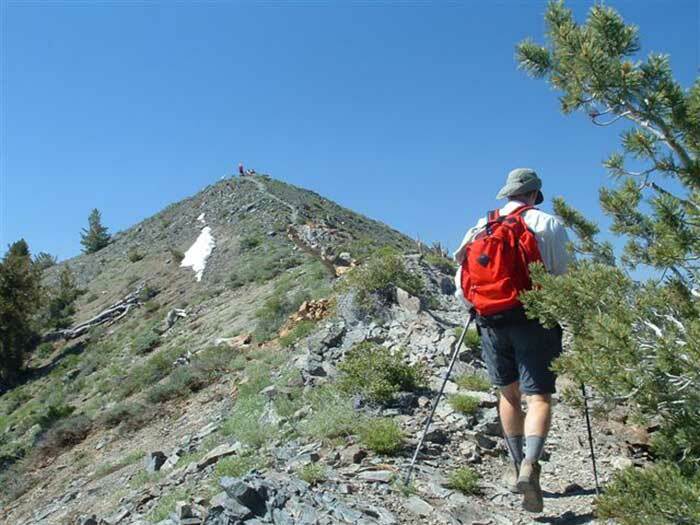 The stronger and younger members of our group forged ahead and soon disappeared up the trail as they hurried on to the summit. To this point, the trail had been a relatively easy eight percent grade ascent, but now I struggled to continue. As we stopped for rest more frequently, my thighs complained of lactic buildup. Twenty-seven hours earlier I had been at sea level in Orange County. Now at 10,000 feet, I had not acclimated to the elevation as rapidly as the others had. Still, I moved on, taking one switchback at a time as I slowly climbed the remaining mile-and-half to the summit. One final switchback and I reached the main summit ridge. My wife’s cousin, Rick, waited patiently for me so we reach the summit together. We rounded the trail and straight ahead lay the summit 100 yards to the south. What a welcome sight after four-and-half hours of hiking! The first of our group had been at the peak for a while. They encouraged Rick and me to hurry to the top. With renewed energy, we quickly covered the rocky path to the summit. Completing a hike to any high peak is a personal achievement, when done with friends, it has an even deeper and more fulfilling meaning. From the summit of Telescope Peak, we had a 360º view of the surrounding basins and mountains. Death Valley lay before us, to the east, a vast panorama. 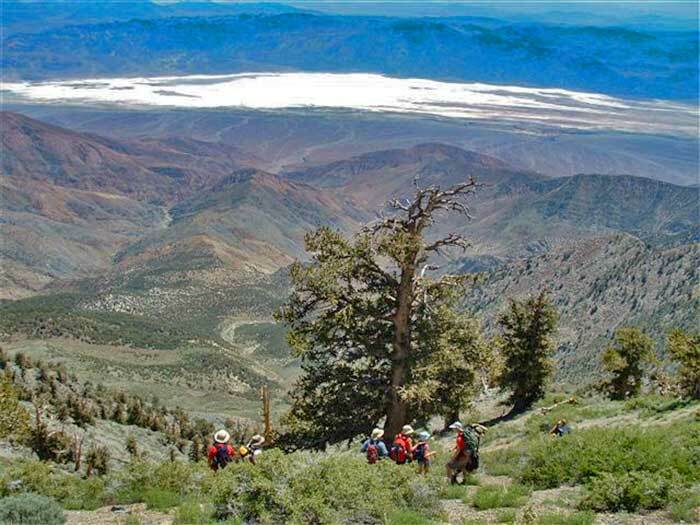 The Sierra Nevada Mountains lay on the distant horizon to the northwest, beyond the Inyo Mountains. After some discussion and taking a bearing with the GPS, we identified Mount Whitey among the many snow caped peaks. To the west, we could see Panamint Valley, China Lake and the Coso Range. “Not sure,” someone said, “but today’s forecast for the valley is 114 degrees.” At the top of Telescope Peak, 11,331 feet above Badwater, the temperature was in the mid to high 70s, accompanied by a cool breeze. We would have loved to stay to enjoy the views and solitude, but our hike was only half over. We gathered to take the traditional summit pictures, hoisted our packs onto our backs, and headed down the seven-mile trail back to camp. Cool! Lush! Green! A typical mid-summer day in Death Valley National Park. As I moved down the trail, my stereotypical image of Death Valley had changed. Clyde D. Elliott, the “one-kidney backpacker,” still hikes and writes after his surgery to remove a cancerous kidney in 2000. From Highway 178, take Lower Wildrose Canyon east nine miles on a narrow road to the junction of Emigrant Pass Road, or from Highway 190, take Emigrant Pass Road south 21 miles to the junction of Lower Wildrose Canyon. From the junction, continue east through Upper Wildrose Canyon seven miles to the historical Wildrose Charcoal Kilns. Just past the kilns, a sign, “4X4 HIGH CLEARANCE RECOMMENDED,” is posted. The road for the next two miles, to Mahogany Flat Campground, is rough, steep and slow going. All five of our vehicles managed to negotiate the road, even though only two were a 4X4. We just took it slowly and cautiously, but be sure to check road conditions and closures. Mahogany Flat Campground has 10 campsites, tables and a pit toilet. There is no water. Bring all you need for camp and the hike. Normally, no fires are allowed during the summer months. No fees are charged for camping. If you are unable to negotiate the last two miles of rough road in your vehicle, you can stay at Thorndike Campground, located a half-mile east of the charcoal kilns; however, if you do stay there, your hike to the summit will be about three miles longer. No backcountry permits are required. However, it is recommended that you sign in at the trail register located a few hundred feet up the trail. Click here for the Death Valley National Park Morning Report. It lists the daily weather forecast and current road conditions. Two resorts provide lodging and other commercial services within the park. Facilities are operated at Stovepipe Wells Village by a concessionaire. TWA Services, Inc., provides gasoline, souvenirs and snack service at Scotty's Castle. Furnace Creek Ranch 224 rooms near to The Furnace Creek Inn, Hwy 190 in Death Valley National Park.The Ranch provides guests with charming and comfortable accommodations in a family-type setting. Situated around the 18-hole golf course. All rooms non smoking. Stovepipe Wells Village, in the Heart of Death Valley National Park, is Relaxing and Uncomplicated. All Accommodations Are Moderately Priced. The Village Boasts a Pool, Gift Shop, General Store, Restaurant and more. 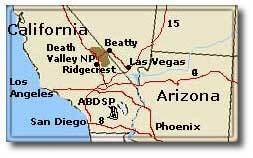 Also see Ridgecrest (61 Miles west ) or Las Vegas (120 miles) click on the city name reservations information.